« Dunhill Black: Oooh! A Car! I came across this banner ad on a news website. 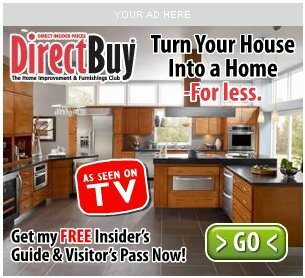 It’s for DirectBuy, a company that sells home remodeling products (flooring, appliances, counter top surfaces, cabinets, etc.). The thing that struck me about this ad is that while it says “turn your house into a home”, the image doesn’t look like a home at all. At best it looks like a model home (you know, the kind of house nobody lives in but has all the latest shiny designer stuff and you can go walk through it and find out about the stuff? ), at worst it looks like a room on a show floor – not part of a house at all (at least it has windows). I guess that I just resent the idea that it takes shiny cupboards and new appliances and slick flooring to make a house a home. To me, those things make a house, a home is some place that people live and love. It’s the place where the couch looks like it gets used all the time, there might be places you suspect spaghetti sauce was once spilled, family photos or mementos are around and you find things like dilapidated teddy bears and books that have clearly been read a thousand times. A “home” is more about the people and pets that live there than about the furnishings. A run down apartment with old appliances and cracks in the wall can as easily be a home as a shiny newly built house because it all depends on the people inside. Living room full of toys when guests arrive? No question – that’s a home, even if Mom is apologizing for the mess. I guess what I’m saying is that a home has character. And while I agree that it’s important to love your house and make it your own, which can sometimes mean remodeling, that’s not what makes it a home. It can be a home before the remodeling happens as easily as after, even if everyone really wants the remodeling to happen. And model houses never look like homes to me. They have no books that look like anyone has ever read them, no toys that look like they were ever played with, no children’s drawings on the refrigerator, no half-finished projects tucked into a corner or in a side room (usually not even half-finished projects if there’s a sewing room), the pet food bowls don’t look like they’ve been eaten from or pushed around the floor, no half-squeezed toothpaste tubes in the bathrooms. These things don’t make a home, but they’re a good sign that you’re in one. This entry was posted on December 17, 2009 at 12:00 pm	and is filed under Home. Tagged: banner-ad, directbuy, homes, kitchen, remodeling. You can follow any responses to this entry through the RSS 2.0 feed. You can leave a response, or trackback from your own site. There are a lot of people selling the dream of a beautiful home. They aren’t really trying to sell you the beautiful house itself, what they’re really promising is the idea that along with that beautiful, immaculately decorated, and perfectly furnished place, comes the beautiful life that you don’t have. But as you say, that’s not how life works. No matter how much money you have or how beautiful you make your living space, once you’ve passed the basic needs of food and shelter, the thing that will make you happy is the people who live there with you and the relationships and memories you share with them. It’s just so much heart-breakingly easier to buy new pillows for the couch than it is to admit that you need to go to marriage counseling. Given that Direct Buy is a bad deal for most people, making it a borderline scam, I’m not surprised their ads would push unhealthy ideas of a “real” home.